Telenor Pakistan has always remain committed with the mission to promote digital inclusion and to strengthen the mobile broadband ecosystem in the country. 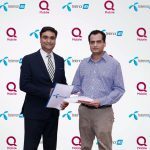 Following the trend, Telenor Pakistan has partnered with QMobile, Pakistan’s top-selling mobile phone brand for Larger 4G Penetration in the Country. The MOU was signed between Irfan Wahab Khan, CEO, Telenor Pakistan, and Zeeshan Akhtar, CEO, QMobile during an MOU signing ceremony. The partnership will enable both parties to work together to develop and promote a robust digital ecosystem in Pakistan where industry’s best digital products and services are served to their mutual customer base. As a result of this initiative, all new and upcoming QMobile 4G smartphones will support Telenor’s superior 4G networks’ 850 MHz band. This will enable Telenor customers with the best internet experience on their QMobile devices. In addition, both companies plan to cooperate on other avenues of strategic importance such as device ecosystem, digital platforms & payment solution developments. “Our partnership with QMobile is of major significance as we continue our journey toward a digital Pakistan. Telenor is Pakistan’s foremost digital lifestyle partner and is continuously striving for larger penetration of mobile broadband across the country. Our association with Pakistan’s top-selling mobile brand will enable us to deliver our best-in-class 4G services to QMobile’s massive nationwide clientele, besides helping us reach our digital inclusion goals”said Irfan Wahab Khan, CEO, Telenor Pakistan, while sharing his thoughts on the development.